How beautifully selected does a deluxe sampler set get? 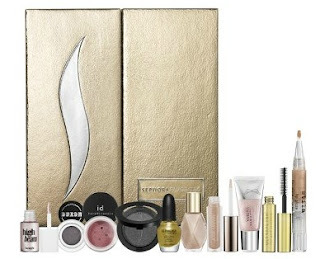 Expertly in the case of Sephora's limited-edition Glitz & Glam deluxe makeup sampler ($40). I have one to give away. This purchase was an instance of "one for me, one for them" while I was shopping on day. I love these carefully edited sets. This dazzling makeup collection contains 10 of Sephora's most shimmering products, all of which will leave you positively luminous. There are even three full-sized products in the set. This collection is the perfect starter kit for anyone who wants to up her glamour quotient - or try some new makeup. It includes an array of gorgeous, gleaming beauties - and items from some of my favorite brands, like Benefit, Tarte, Stila, and Ultraflesh! The winnner's going to glow! How can you enter to win this Shimmer Brick contest (technically a sweepstakes)? Just leave a comment on this feature (not in another BTiB post). After you comment here, feel free to send me an e-mail at bestthingsinbeautycontests@gmail.com (the contest address, not my "personal" e-mail) and identify your comment. You can never be too careful about sharing an e-mail address you care about on a blog, so feel free to follow this step (an alternative is to code your e-mail, e.g., myname at gmail dot com, in your comment). Please make sure I have your e-mail. If I can't notify you, you can't win - even if your number is drawn. I can't believe the number of entrants I haven't been able to find in the past. The deadline for entries will be Saturday, July 21, at midnight. The next morning, I will use a random number generator (random.org) to select the winner. I will e-mail the winner on Sunday morning. The winner will have 48 hours to reply to my message and provide a shipping address. After 48 hours, the prize will be forfeited, and another winner will be selected. Make sure to check your e-mail - and look in your spam folder - when the contest ends. What a prize! Would love to have a play wth this little lot on the run up to my wedding! What fun! I'd love to win this. I just googled it and it's sold out! Can't believe I missed out, would love to win here. I also follow you on Google Reader. this would be so fun to win..thanks for the chance!! I have in mind a beautiful young lady in New Orleans, my son's love, who recently graduated from Tulane! I would love to share this with her! She glows and shimmers always to me, and he, and I am sure she would love to play with this amazing kit! I follow you through your blog, and email! Sorry I did not include in my post! I've wanted to try the Buxom Stay- There shadow, so this would be a great opportunity. Let's see if my luck holds! this would be great to take on vacation with me.............everything included I would need. Gotta love minis! They're so cute and you can actually manage to empty/hit pan! You always the BEST giveaways! And this one is spectacular! What a great collection! I WANT THIS!! What a fantastic giveaway! I have been thinking about adding several of these items to my beauty arsenal! I follow with GFC - lov2read68. My email is kristicrabtree (at )hotmail (dot) com. What an exciting group of products! Hi, I just signed up for your blog today and lucky me saw this draw..I hope I win! Looks like a great set! I'd love to try these products! What a fun prize! I follow by email, twitter, etc. Oooh lala I am in love with that set of cosmetics! Thanks for the giveaway!! Hi CG, thank you for the giveaway opportunity! I follow via GFC/Google Reader as BooBooNinja. I also follow your twitter and tweeted (email to follow with details). greaet giveaway! i love benefit cosmetics!! i would LOVE to win this! i love sephora! gorgeous! i totally want this! i love to glow in the summertime! This is a great looking set of glitzy glammer fun! Oh my goodness, I want this so much but by the time I got to it it was all sold out! =( Thanks for the opportunity! I subscribe through email. Thanks for the chance! New reader here! Found your blog when searching 'Shiseido Bronzing Powder'. What a great giveaway! beautybohemeblog at gmail dot com. Just subscribed by email. Thanks! i love all things shimmery! I love Sephora's collections. This one is amazing! I love this. Thanks so much for your generous giveaways. I follow through email. Such a cute set! Fingers crossed! My life could definitely use a little glitz right about now; I'm feeling extremely down due to the anniversary of my eldest daughter's death this month. (Sorry if I bummed anyone out, but I don't have much of a support group around me and this really preys on my mind). Thank you for another great giveaway, CG, and I will keep both you and your mother in my thoughts and prayers. I lost my own mother exactly two weeks to the day after my 29-year-old daughter's death. Although my mom was 92, I was completely reeling from the losses being so close together. That was in 2001, and sometimes it still seems as tho it just happened. I'm sorry; please forgive me for using what was supposed to be a contest entry as a sounding board for my personal problems. It's just a little difficult to keep my head straight right now! Thank you for listening. milktea said... I'd really like this set as Best of Sephora Favourites usually feature bestsellers in Beauty. Something which is not so easy to find at my local store. What an exciting giveaway! I especially like the Tarina Tarantino Sparklicity Gloss. What a wonderful giveaway! All the items are simply amazing and too good to be missed. Followed your blog via email and GFC. thanks so much for the chance! these beauty products look great! This would be so great to have. Such a variety of products! I'm intrigued by the Ultraflesh Gold Standard Mascara in black. Amazing prize, thank you so much!! Amazing, you will make one lady soooo happy!! Great Giveaway! I am an email follower. k8reall(at)hotmail(dot)com.